The inspiration for this dessert comes from a dish that may or may not have been on the catering menu at the Radisson Hotel and Conference Center in Green Bay approximately 5 years ago. That dessert may or may not have included honey and lavender flavors. Either way, we thought the flavor combination would go well together, and this dessert is what we devised in order to get them on the same plate. You may or may not be surprised that they play very well together. Apparently, we’re feeling very wishy washy today. What could be a better idea than sorbet made from Leine's Honey Weiss? To make syrup, bring water, sugar, and honey to boil in small saucepan over medium high heat. Cook until sugar dissolves. Remove from heat and cool to room temperature. Whisk together beer, syrup, and lemon juice in medium bowl. Beer may foam a bit, but that’s okay. It’ll foam less with this simply syrup than it would with undissolved sugar. Transfer mixture to ice cream machine and freeze according to manufacturer’s instructions. Once you have a frozen sorbet, place in freezer and let it solidify completely overnight. An herby indulgence with a "shot" of awesome. Cream butter and sugar together until fluffy. Add eggs one at a time, and mix well after each addition. Fold in the flour, lavender, milk, and vanilla. Pour cake mix into greased 8-inch ring pan. Bake 1 hour or until toothpick comes out clean. Remove from oven and let sit 5 minutes. Remove from cake pan and cool completely on wire rack. Combine powdered sugar, vanilla, and milk in small bowl. Pour over cake. Serve with Honey Weiss Sorbet. 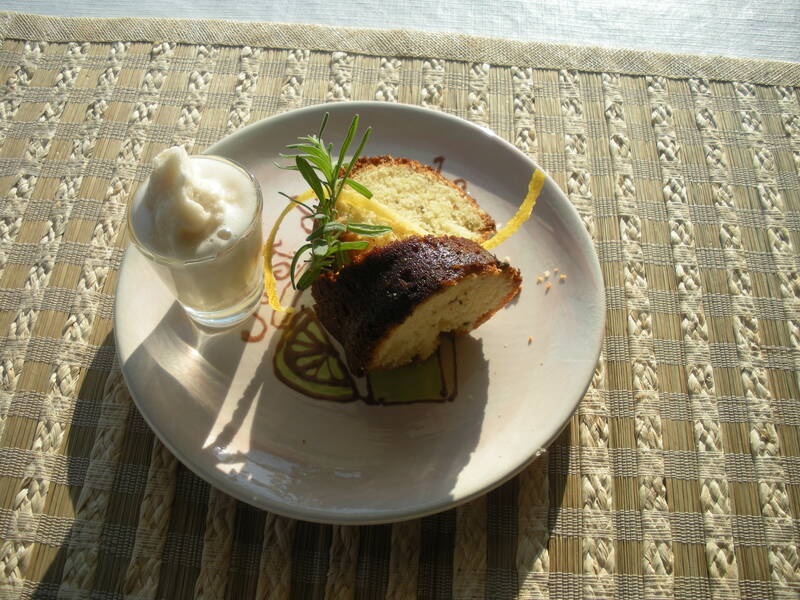 Lavender cake is a cross between a traditional English tea cake and a bundt style cake. It will be more crumbly and drier than your typical sheet cake. Glaze is not only delicious, but essential. Sorbet will be on the sweeter side with a clear taste of beer. The longer it’s in the freezer, the better it gets (barring freezer burn). 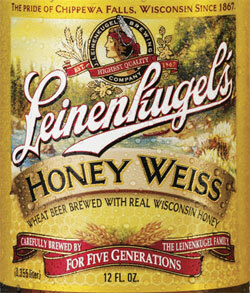 This entry was posted in Desserts and tagged Leinenkugel. Bookmark the permalink.